For POET Biorefining in Portland, Indiana and its young general manager, a welcoming community was key to their success. As Indiana approached the middle of the first decade of a new millennium, Sen. Richard Lugar was frustrated. The Hoosier senator had been among the first of his peers to recognize and advocate the importance of moving toward energy independence through homegrown biofuels. But while states in the western Corn Belt had been quick to recognize the value-added opportunities from ethanol plants, Indiana – the fifth-largest corn-producing state – had only one, twenty year-old plant. 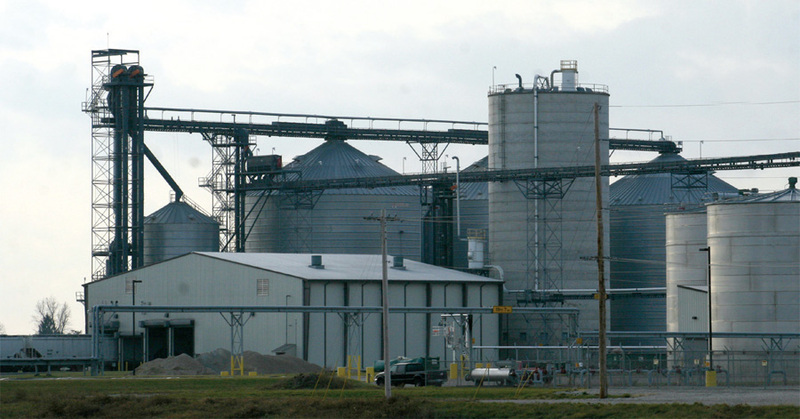 As new-generation plants finally began coming online in his home state in 2007, POET Biorefining – Portland was the first POET biorefinery in Indiana, and one of the very first new ethanol plants in the Hoosier state. When the state-of-the-art, $105 million, 69 million gallon plant celebrated its grand opening on Sept. 14, 2007, Lugar was one of the main speakers. At the time, ethanol was new to Indiana, and many communities were skeptical, or even hostile, to the idea of the new plants. But POET Biorefining – Portland General Manager Matt Tomano – one of the youngest GMs in the POET family at 33 – says that the Portland community was very receptive to the idea from the start. 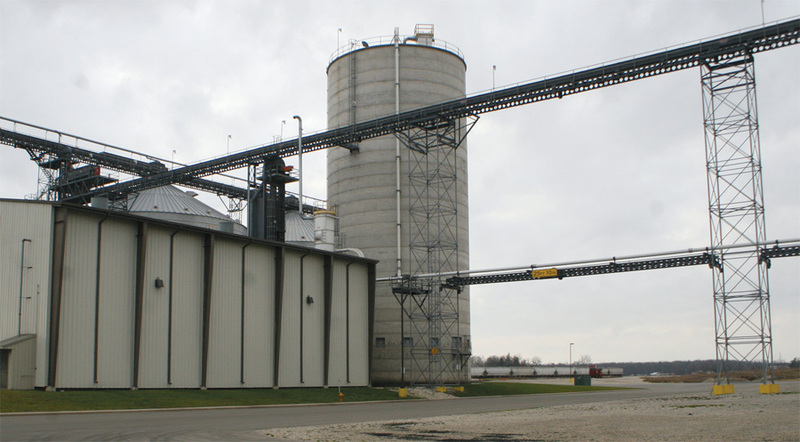 POET Biorefining – Portland recently celebrated its fifth anniversary, and during that time it has not only helped lead Indiana into the biofuels era, but has also become the boon to area farmers and the community that Lugar had predicted. Portland mayor Randy Geesaman says the plant’s economic development impact has been community wide. 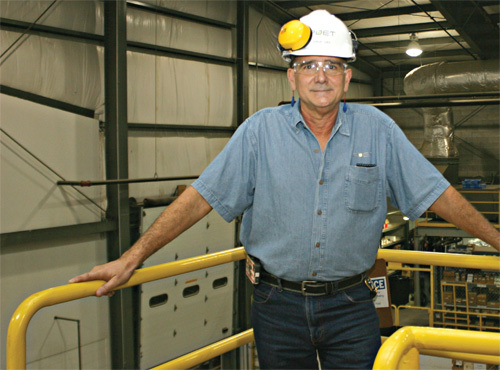 “The plant has helped to diversify our industrial base, and the job creation and community involvement in both Portland and Jay County have been tremendous,” he says. The plant has also become an exemplary corporate citizen, quickly getting involved in a myriad of community activities. A few of its good works include supporting local 4-H fairs and 4-H auctions, being a United Way Pacesetter organization, helping to build a Habitat for Humanity home at the Indiana State Fair, and helping to replace the gym floor at a local community center following a 2011 flood in Portland. In its five years, POET Biorefining – Portland has seen both good and challenging years, but like other members of the POET family, has weathered the storms. Even in a drought year like 2012 that shot corn prices to record levels, the plant continues to produce, even with squeezed margins. It is aided by the POET system, but also by a good location – the plant sources all of its process water from a quarry across the road, which reduces its water costs to near zero. The plant also added corn oil to its product mix in December. The plant has a good track record for recognizing and rewarding talent and initiative. Numerous POET Biorefining – Portland employees have been promoted to management positions, both at Portland and other POET plants. One of those individuals is Tomano, who with his elementary school principal wife, Erica, has been able to build a good career and life just a few miles from where he grew up in nearby Berne. After coming out of a private CPA firm, then serving as plant controller since startup, Tomano has found the shift from accounting to the general manager’s chair most satisfying. In 2000, Audrey Muhlenkamp graduated from Jay County High School, just a short distance down the road from POET Biorefining – Portland. While a student at Purdue University, she interned with the United States Department of Agriculture’s (USDA) National Agricultural Statistics Service (NASS) and was offered a job after graduation. For the next five years she worked in the NASS office in Madison, Wis., helping that agency to estimate Wisconsin’s share of the national yields for corn, soybeans and other crops and commodities. “It was fun and I learned a lot, but there was talk of closing our office to cut costs, and I didn’t want to get downsized,” says Muhlenkamp. So she came back to Portland as a grain buyer for POET. 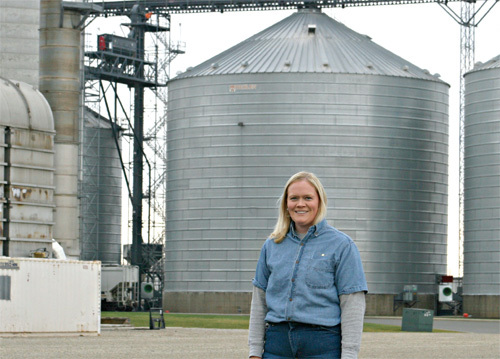 Muhlenkamp says she enjoys following the markets and working with farmers, but she’s also been able to put some of her NASS skills to work, helping the Portland plant, area farmers, and others in the POET family improve their risk management by estimating corn yields. She says that it’s been satisfying to apply her previously-learned skills, especially in working with farmers. “A lot of farmers are skeptical of USDA’s yield estimates, but when they see some of the data collection procedures we use, they’re surprised to find out that those methods are pretty hands-on,” she says. Muhlenkamp says having the opportunity to move back to Portland has been a good thing for her. “It’s nice to be home around family and friends,” she says. Portland’s Environmental, Health and Safety Specialist, Steve Huey, likes challenges – that’s what brought him to POET in the first place. Another challenge Huey has taken on is raising money for the Red Cross, and he’s living proof that helping one’s community can also be fun. Huey and a team from POET race go karts to help out the chapter in neighboring Mercer County, Ohio. “I’d started doing this before I came to POET, and when I came here I asked management if they’d be willing to sponsor a car, and they said ‘Sure,’” he says. The project has now grown into a two-state, six-race series that has raised from $12,000 to $48,000 per year.